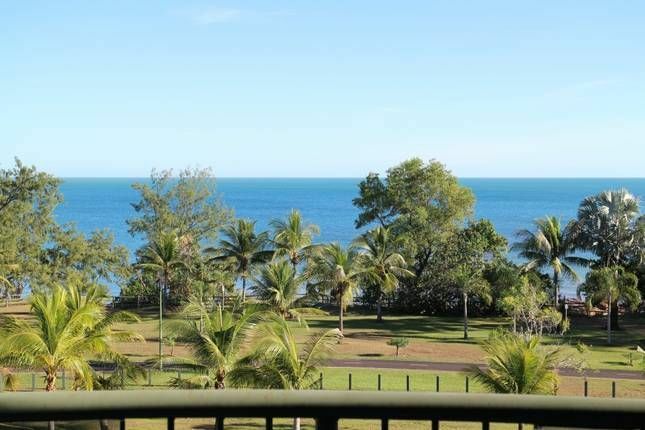 Situated on the beautiful foreshore of Nightcliff, enjoy the stunning sea view and relaxing atmosphere from this top floor modern 2 bedroom apartment. Celebrate the 'moment' from the balcony with your favourite beverage, cook a bbq, or relax on the balcony lounge and watch the changing colours of the sunset over the Arafura sea. The spacious apartment has lift access, secure parking, modern furnishings and is air-conditioned throughout. Enjoy the comfort of 2 queen size beds, (and extra bed(s) provided if required), and a separate toilet and bathroom. You will be able to make use of a basic pantry of foodstuffs, a coffee machine, juicer, water-cooler, bbq, TV/DVD/stereo entertainment system, ipod/iphone dock, laundry, and fully-equipped gourmet kitchen with dishwasher. Only 15mins from the CBD, and the airport, and close to public transport. Enjoy the local attractions along this popular foreshore - a 5 min walk to the Nightcliff pool and the pub, around the corner to the colourful Sunday market, shops and restaurants. Use the bicycles to go for a leisurely coastal ride, or take a walk along the beach, have a picnic or try some fishing at the jetty, or off the rocks at your doorstep.Then after a day of sightseeing to local attractions nearby why not take a book and relax on the balcony lounge before toasting again 'your happy moments of the day' ! Picnic gear, Bikes (inc. kids), Fishing rods, Books, DVDs, board games, and some outdoor recreation gear supplied. What a view to sea, indeed! My friend and I had such a great time staying here. Waking up to that amazing view every day was incredible! The apartment had everything we needed and more - it was big and airy and felt like home the moment we walked in. Jodie provides anything you can think of. The apartment is in the best part of Darwin with great food and coffee just minutes away. Thanks so much - it was a heavenly holiday. From the moment we arrived we were made to feel at home.The host was delightful and full of local knowledge.The position is fantastic and the use of the bikes made everything so much more accessible .Would recommend hiring a car though as well.The unit was exceptionally well equipped and functional.The views are amazing and we will certainly go back to watch the stormy season and highly recommend this unit to anyone.Thanks Jodie for allowing us to share your home. Everything has been thought of here - from indoor and outdoor comfort, outdoor activity options, to cooking facilities and extra little treats... breezy, cool, thoughtfulness everywhere! Whataview2sea was clean and smartly furnishedcomfortable,, in a ideal position and thoroughly equipped. We thoroughly enjoyed our stay. Very comfortable. Very restful. Great base to explore and enjoy Darwin and surrounding areas. WOW! the service and accommodation were outstanding. From the moment we arrived we were made to feel welcomed and at home. Excellent location woth amazing views!